Caroline Goodwin was born on a Georgia plantation in 1875 but spent years working for progressive causes, including woman suffrage and world peace. She had gone to Europe to study art, and there she met Daniel O’Day, with whom she moved to New York after they married. In fact, it was Daniel who first asked Caroline why she was watching a suffrage parade with him rather than marching in it. After joining the League of Women Voters, O’Day met Eleanor Roosevelt and later began working with New York City settlement houses and the Women’s International League for Peace and Freedom. O’Day held several state and Democratic Party appointments in New York before joining the 1934 race for two at-large U.S. House seats. Eleanor Roosevelt, by then First Lady, campaigned for her friend and even chaired her campaign committee. It was the first time a First Lady actively campaigned for any congressional candidate; Roosevelt said she was “justified” because the campaign was in her own state. O’Day won the largest share of the votes in the election and went on to serve four terms in the House. For the last three terms, she chaired the Committee on Election of President, Vice President, and Representatives in Congress. O’Day worked passionately for world peace; she also advocated New Deal programs that supported labor and children as well as the various arts programs under the Works Progress Administration. She also invested in civil rights causes, including supporting 1935 and 1937 antilynching bills and opposing detention camps for aliens in the years leading into WWII. During those years, O’Day opposed Roosevelt administration actions that presaged US involvement in the war, but Nazi treatment of Jews and minorities and the Japanese attack on Pearl Harbor led her to shift her position. While ill health kept her from Congress when it voted to declare war on Japan, she told colleagues she would have voted for the war resolution. That poor health prevented O’Day from running for reelection in 1942, and her final term in Congress ended on January 3, 1943. She died the next day in New York. Wasniewski, Matthew, editor in chief, Women in Congress, 1917-2006 (2006), pp. 155-157. Capitol Myths: Brumidi Falls to his Death? This Sunday, the U.S. Capitol Historical Society is partnering with the Woolly Mammoth Theatre Company to present “The Price of Beauty: History and Legend at the Heart of the Capital.” The free program (get your ticket here, though you will need separate tickets for the play) is part of the House Lights Up series for the new production of Guards at the Taj. Rajiv Joseph’s play touches on many themes, including definitions of beauty, myths that surround great buildings, and the unsung laborers who build those buildings. “The Price of Beauty” will connect those themes to one of Washington’s own great buildings, the Capitol. In thinking about the event, I was reminded of Jane Armstrong Hudiburg’s examination of a Capitol myth in a 2014 edition of The Capitol Dome. “‘From the Giddy Height Above’: Investigating Constantino Brumidi’s Final Days in the Capitol Rotunda” looks to first-hand accounts to understand what actually happened the day Constantino Brumidi, then in his 70s, fell from the scaffolding in the Rotunda, where he was working on the Frieze of American History that runs around the base of the Dome. Did he fall to his death? Hang from weak arms for fifteen minutes? Just trip a little? And did this fall affect his ability to complete his work on the frieze? Current guides with the Capitol Visitor Center Services, however, are well aware that Constantino Brumidi (fig. 1), the nineteenth-century Italian artist, survived that fall, or actually, that near fall, in 1879 from the scaffolding fifty-eight feet above the Rotunda floor. Indeed, it is one of the favorite stories relayed to the tourists and school groups visiting the Capitol each day. Guides point to each of the frieze’s scenes, which encircle the base of the Dome, beginning with Columbus walking into the New World, and pause at the one depicting “William Penn and the Indians” (fig. 2). “Do you see where the background behind Penn changes from a darker taupe to a lighter color?” a guide is likely to ask. Heads craned upwards nod. “That is where Brumidi fell. He managed to grab the scaffolding”—and here the guide may mimic swinging on monkey bars—“and held on for several minutes before being rescued. He didn’t get hurt, but he was shaken up, and he never finished the scene.” Seeking a strong reaction, the guide is never disappointed. While older visitors may gasp, middle-school students, in particular, perk up, their faces brighten. Finally, an interesting story to catch their attention: an old man, in his seventies, dangling from a platform high above the Rotunda floor. Still, one is left to wonder, could a frail, elderly man really save himself in such a dramatic fashion? And, if so, how did the accident affect the outcome of the Frieze of American History, one of the most iconic artworks in the Capitol? You can find the full article–including the author’s best guess as to what really happened on the scaffolding that day–in the online edition of The Capitol Dome starting on page 28. And in the comments below, let us know what myths you’ve heard about the Capitol; we’ll consider investigating some of them! The annual Congressional Baseball Game, while a lovely fundraiser for charity, can’t quite give those of us in Washington the frisson of excitement that a big league playoff run does. The first postseason Nationals game kicks off in about an hour, and it’s been ALL OVER the news. It was from the Washington Post that we first learned about this gem of a find at the Library of Congress. Mike Mashon, head of the Moving Image Section at the Library, tells the whole story in this post, but here’s the short version: when the Library recently acquired some long-forgotten newsreels, staffers were surprised to see footage from the Senators’ 1924 World Series win–the only known footage of the series and its final 12-inning game. As the Nationals romped through the end of the 2014 season, the moving image staff expedited conservation of the film and recently made the digital transfer available online. And just for fun, thanks to Popville for bringing to our attention this picture of the dinosaur outside the National Geographic Museum in downtown DC. While doing some Tweet-of-the-Day research that didn’t pan out, I came across a terrific cultural artifact. There are so many incredible details in this picture, which presents a specific image of 1950 that reminds us that the stereotypes we traffic in about the past have some basis in reality–or at least in a reality that was attractive at the time and not just now. It must be a publicity photo; the flora suggests a California location. What would an analogous PR piece look like today? Well, here’s a poster from the 2010 census. It’s looking outdated already, in its own way. OK, two more from the 1950 census, with captions from the Census Bureau. Then I’ll stop. 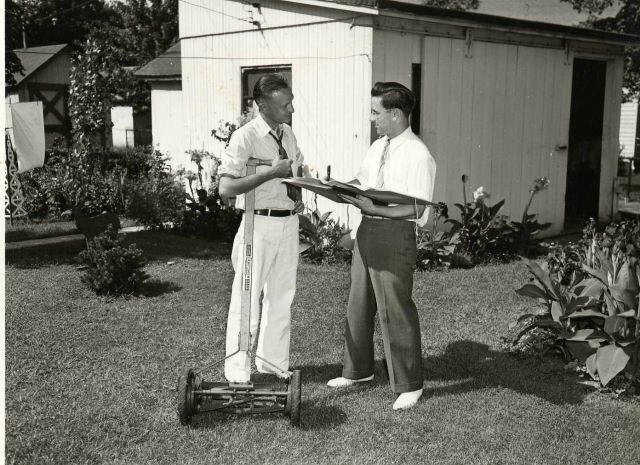 There’s a series of image galleries for each census year on the Census Bureau’s history pages. Enjoy! Here at USCHS, we’re naturally fans of Article I of the Constitution, which established the legislative branch (Congress), so we’re pleased to see that the National Constitution Center is focusing on that branch in this year’s celebrations. Article II covers the executive branch (the president and departments below him or her), and Article III addresses the judicial branch (court system). The remainder of the document covers state/state and state/federal relationships, amending the Constitution, the continuance of government obligations contracted under the Articles of Confederation, and ratification. The amendments follow. September 17 was chosen as Constitution Day because it’s the day that Constitutional Convention delegates signed the completed document in 1787. June 21 would also be a good day to learn about our government’s framework: it’s the day New Hampshire ratified the Constitution in 1788. It was the ninth state to do so, and the action brought the document into force and our current system of government into being (more or less). Some states, such as Massachusetts, voted for ratification only after assurances that the new government would soon work on amendments addressing issues like guaranteeing the freedom of speech. Rhode Island was the last of the original colonies to ratify the Constitution in 1790. The Senate History Office has a good overview of the process of writing and ratifying the Constitution (plus a paragraph about the history of Constitution Day), as does the History Channel. The U.S. Capitol Historical Society has lesson plans for teachers. The National Archives also has great resources. In honor of the “world’s longest surviving written charter of government” (Senate History), tell us your favorite thing about the Constitution in the comments!